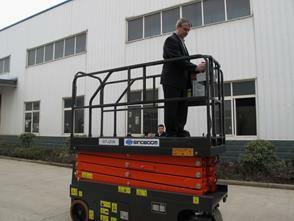 GTJZ0808 Self-propelled Scissor lifts are mainly used in flat indoor or outdoor. The body is pleasing to eye; the product is compact in structure and flexible to operate. The main engine is designed as dual-driven dual steering with self-travelling and turning functions. It features imported hydraulic components, explosion-proof pipe unit and emergency descending unit; hydraulically driven travelling function; low in noises and free of air pollution; durable, chip-free, skid-proof and traceless tires without scratching the ground; optimized product control mode and procedure with the premise of safety, bringing much more humanized operation. 1. Small turning radius: The outside turning radius of the tires is 6 ft 9 in (2.1 m) and the inside turning radius is 0 ft (0 m). 2. Large load capacity: The maximal load capacity reaches 551 lbs (250 kg) and the load capacity of the extended platform is up to 265 lbs (120 kg). 3. Sufficient electric power: Trojan batteries imported from USA are used with four groups in series, with capacity up to 225Ah; 8h duration in normal operation. 4. Advanced technology: Adpot DeltaTech control system and fault self-diagnosis technique, with anti-collision transducer option. 5. High reliability: Imported key components and the waterproof capacity of major electric components is up to IP65. 6. Good safety: Equipped with horizontal switch and weighing sensor, which ensures the safety of equipment and operators. 7. Easy maintenance: Dual revolving doors, easy to maintain. 8. Energy-saving and environment-friendly: Low noise, no pollution, up to energy-saving and environmental protection standard.